Armor : Divine - or - Infused on big enchant armor pieces like chest/head/legs, and the rest in divine. Jewels : Spell cost reduction. Insane healing set, with all the HoT running, it will proc 95% of time. Major problem is the size of it, in well coordinate group, it's clearly the best way to go. An alternative is the Earthgore : insane healing in massive area, but big problem : need someone to be under 50% to proc it, and in vTrials/vDLCdungeons dangerous thing will OS you. BUT in some situations, it can be a life saver and avoid a wipe (when DD do not roll-dodge it thinking it's a bad thing... Yeah it happens...). 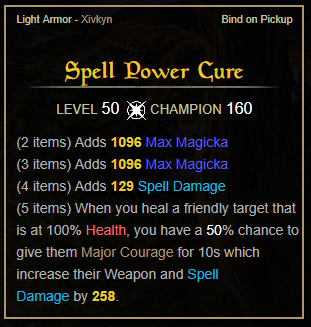 The choice is yours, but keep in mind, one of the main goal of this build is to overheal without using magicka to proc Spell Power Cure. One of the best healing set of the game, it gives a damage boost (Major Courage) when you overheal someone and it happens ALL THE TIME, especially with all your aoe/HoT. There is a few alternative : Olorimë, this set will also give the same boost but for 30sec. BUT the major problem is that DD need to walk in the zone to get it : Meaning you have to put it on them with your aoe ability, and you will lose a bonus from a set since it has the same minor shield buff than twilight remedy. Plus, the fight need to be started to proc, where Spell Power Cure can proc any time. This one need practice and skill to be used, but really effective too. You can also go with Jorvuld, if you want to feel more like a support buff (it will up every major/minor buff you give to other by 40%), this one is REALLY good too, no major cons : only your choice depending to how you want to play. The Core of this build, it will give MASSIVE HoT, and a Crit Damage boost (Minor Force, so it actually adds up with Spell Power Cure, giving a damage boost and crit boost to your DD). Atronach : the best way to go, give insane magicka regen with the divine trait (the more you can heal, the less other can die). Apprentice : 2nd option if you trust your ressources management skills, it will give more raw healing. Ritual : USELESS, do not use this. You are already overhealing with just CP points, and set. Basically, for mag heal, none of the medium armor passives are useful, neither is the undaunted : you lose 2% of magicka/health/vigor. But not every passive in armors needs 5 pieces to be used. For example, you can put shoulders in light if you want the 2% reduce cost/magicka regen, or go for 2 heavy pieces to be a little more tanky (keep in mind that your survival is your group's survival.). Head must always be in heavy, since it's one of the armor pieces with the highest armor value. The choice is yours, but I personally prefer to gain more useful passives than a 2%magicka (especially for Breton). KEEP IN MIND THAT : IT IS A BUILD BASED ON COOPERATION WITH YOUR GROUP, PEOPLE NEED TO ALSO ACTIVATE THE SYNERGY TO GET THIS BUILD TO WORK AT FULL POTENTIAL. 2. Launch your synergy (Luminous shard on group of DD in trials > Energy orb (3-4 in dungeon, and 5-6 in trials if other heal launch them too, or 8-11 if you choose to rotate with other heal). Note : be careful here, only YOUR synergy give boost to allies, I advise to always launch maximum of energy orb as you can (11 max) in a "not so fast" tempo so you don't run out of magicka in 5sec. 3. Put the Healing springs on biggest group to ensure healing on every little damage taken. - If it goes well, you can heavy attack and recharge, and keep rotating. - If some people are taking some damage, you can "emergency heal" with Breath of life/Healing spring. [5.] Some mobs will die faster, so, in middle/end of the fight, never forget to use Repentance : it's a free heal spell that also give stamina back to you and all the group. In midfight : StamDD are going to love you <3. Note : If you go with Olorimë, as soon as the fight begins put healing spring or luminous shardFIRST before any other aoe on DD's group. (that's why I put those spell on "1" on the keyboard). 1.The key here is to know the duration of your buff and zone so you can rotate properly without wasting magicka. For example, Extended ritual last for ~30sec, so it's useless to re-use it, especially if it's well placed and touch everyone. 2.You can change inner light by Repentance on both bar - or - inverse repentance for inner light. 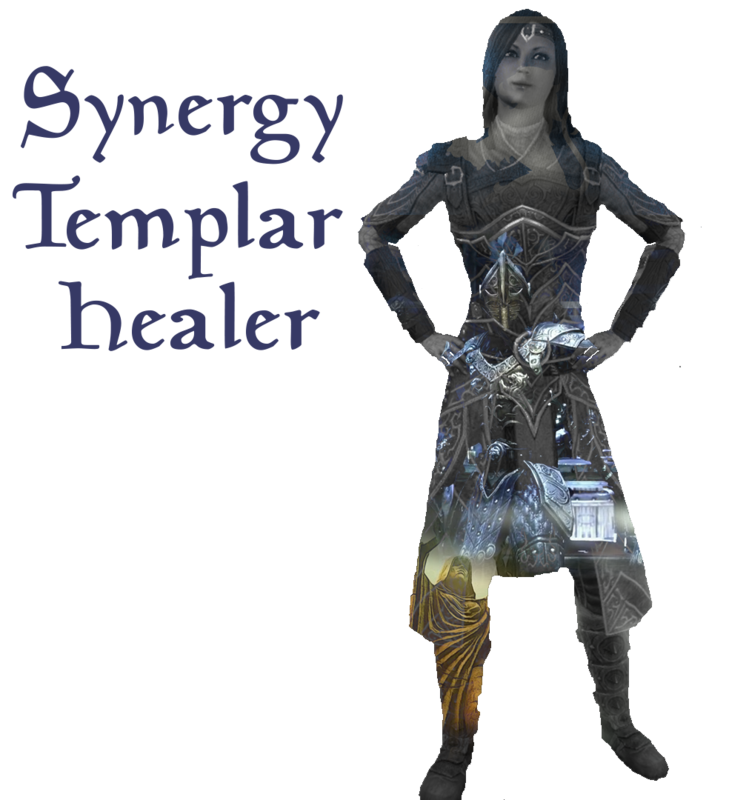 depend on what you prefer : repentance will give you magicka/stam/health regen bonus passive while inner light gives spell critical and max magicka bonus. I have a preference for repentance, since you are Breton you already have 10% magicka + the passives and sets, and it's a free heal and give stam back to everyone. 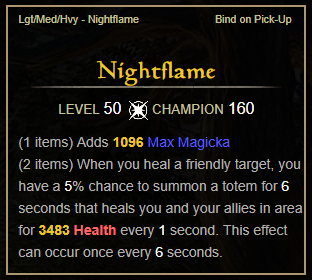 I put inner light on heal bar since it gives 5% magicka max if anything goes wrong (and trust me, IT WILL). Adjust it on how you want to play this. 3.War Horn is here to be used for boss, at beginning and end of the fight, to ensure a nuke, save your ult points for nuke some annoying mobs/boss, OR emergency heal with rite of passage if it goes sideways. You can go with Solar prison instead of rite of passage, giving another synergy, and reducing damage from mobs in the zone. Witchmother's Potent Brew, best food for mag class and way cheaper than the Clockwork Citrus Filet, don't use golden food for vet dungeon or nm trials. It is not worth it (except if you're millionaire). 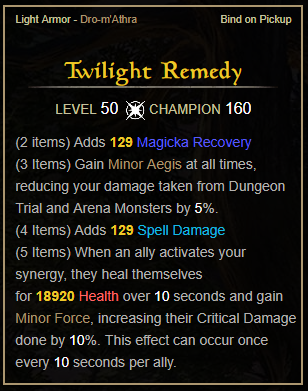 Basic magicka potion that gives magicka and magicka regen, there is not really a need for the Major sorcery one since you're a healer (except if you don't use inner light in your bars, even then except if you want full optimisation, there is not really a need for that). Note : don't forget passive in alchemy and food to improve duration of your consommation. I will only give main core champion point with min requirement, keep in mind that you must adapt to your way of playing, I might prefer tumbling while you can choose Percussion for example. Note : go full Blessed if you want to be a full time healer, or full elemental expert if you want versatilty and do some damage. For example in really easy dungeon : I delete healing spring, and replace it for Extended Ritual, and in the empty slot in destro bar I put : Elemental Blockade, to help melt groups of trash mobs. You can also split point between them like 45/45 each. Thaumaturge (at least 40), for healing over time. ElfBorn (at least 40), for crit heal. What you want : if you have free point, I advise at least 10-25 point in Tumbling to get more roll dodge and avoid aoe more often. Elemental defender and Hardy (at least 40-70 each) : more resistance in general, and be more tanky. Thick skinned (at least 40) : even more "tankyness"
Expert defender (7point) and Quick recovery (3point) so you get to 10 and have the passive in the lord constellation to take less damage while resurecting (it's one of your job in most dungeons, since you're the quickest, and has more passive for this than DD, like res the target with full life).